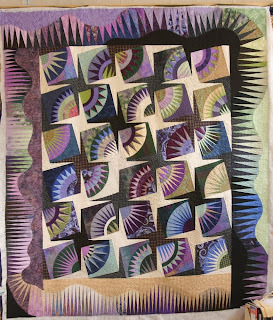 Today I am actually taking some time to work on a quilt for me, my birthday quilt. It hasn't told me it's name yet, but it is coming together quite well. 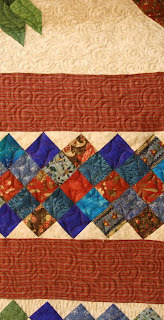 This is the center of the quilt.Which I guess is about 60" square. There will be three boarders added to it now. The first two should be quite quick and will use the rest of the panel the red blocks came from. 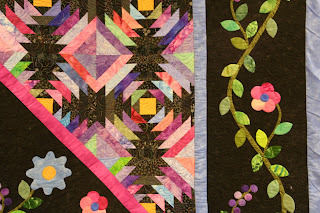 The last border will take a bit longer as I want a spiky curvy boarder so I will be foundation piecing it. 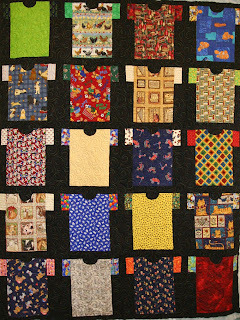 Still it will be fun and I will have a new huge quilt for the bed. I would love to know what the characters mean in the sashing, and indeed if I have them the right way up. It is worrying working with unfamiliar alphabets, you never know what you might be saying. Yesterday I went to the Natural History Museum. This was a little disappointing as I had hoped to see lots of displays of fossils and animals. There were very few fossils there now. I get the impression that the things I find interesting have been declared too boring or difficult to be on display, both at the Natural History Museum and the Science Museum. I think it is a great shame how dumbed down they have both got. I remember there being a lot of things in the museums I didn't understand but I liked that, it gave me things I could go and look up and learn about. Still the building is just as amazing as ever, they aren't allowed to change that as it is a listed building. I wished I had taken my camera as now it is clean it is just one big design source. I will have to go back and take a lot of pictures, hopefully soon. I suppose I might be able to combine that with a trip to see the terracotta army which is currently at the British Museum. I am going to have so many ideas I really won't know where to start, but I suppose that is better than the alternative. 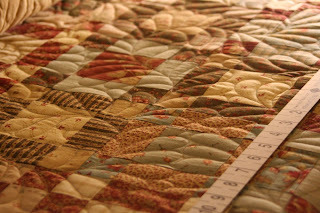 This quilt has spent a lot of time on the frame recently. 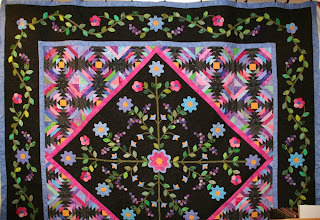 It was pieced and appliqued by Barbara Wharton, from a design by Karen Kay Buckley called Midnight Floral Fantasy. 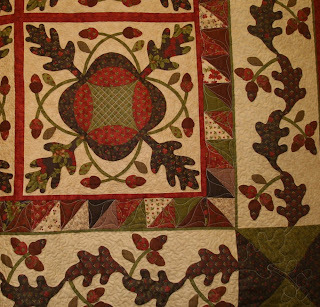 Isn't it a stunning quilt. 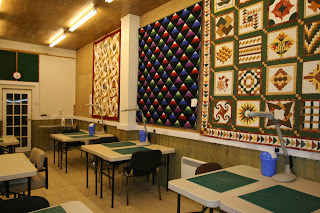 I was thrilled to be given the chance to quilt it. It has been a learning experience, I would never have guessed how long it takes to work such a simple pattern around all the applique. It's just as well I liked looking at it I guess. It's strange spending that much time to try and not attract attention. 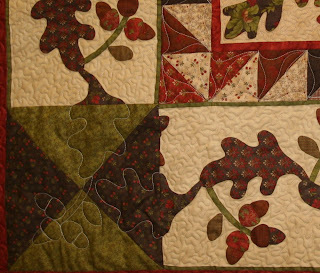 In this quilt I really didn't want the quilting to say much. It has a job to do but it is very much a supporting role, not the star. 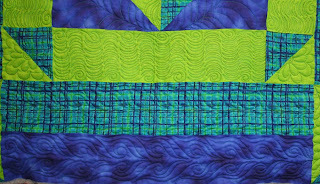 Hopefully you can tell from the pictures the quilting doesn't stand out. We decided to make it a little more obvious in the pieced area, really it would have been hard not to with the mixture of black and colours here. 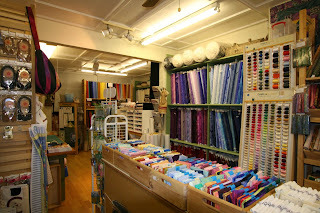 We chose a thread that blends quite well with the colours and helps pull the back together with them. I am really pleased with the effect. 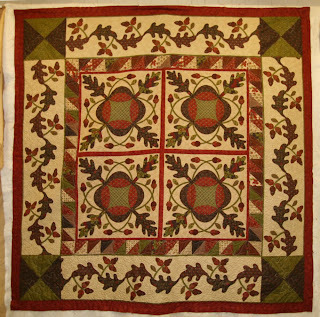 The quilting pattern is the same in all the areas, just the scale and the thread changes depending on what I was trying to achieve. 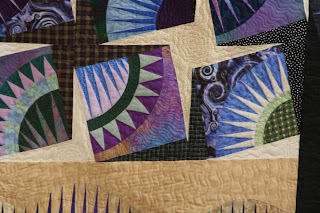 Very close to the applique the quilting is very small curls getting bigger further from it up to the medium size swirls in the coloured area. 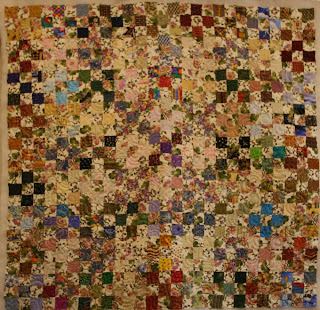 This quilt is about 97 inches square, so even in the quilt shop I couldn't quite get a picture of the whole thing. Had the weather been better I could have taken the photographs outside, but wouldn't you know it, it rained. 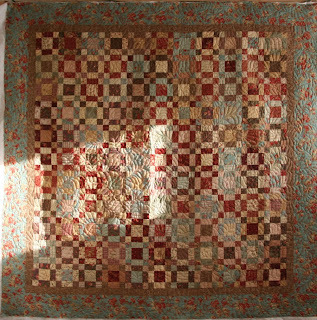 Still I think the pictures do give you an idea of how striking this quilt is. 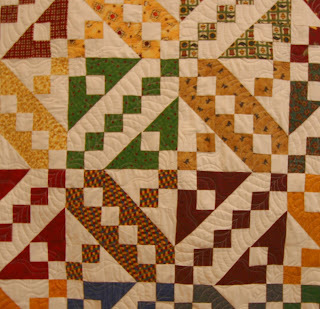 From my point of view, the most important thing is that my customer is happy with the quilting, and she was. I hope she finds the quilt a good home. Well I've done it now, the gallery is booked. 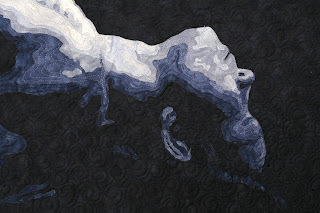 I will be showing some of my work at the Dissenters Gallery from 7th March 2008 to 7th April 2008. It seems a lot more scary now I have confirmed it. 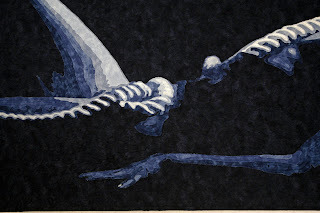 I have plans for all the work that will be on display, I just have to decide the title. I am excited too, but sooo nervous. I guess my next step is to take some time to try and work out the bulk of what has to be done before the opening. I've a feeling it will be a long list. I can finally talk freely about a project I completed back in February. Unfortunately I don't seem to have a picture of it finished but here is 'By the Hearth' in progress. 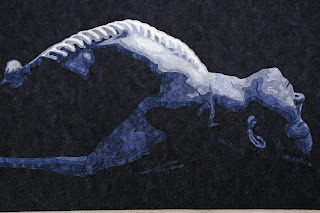 It is a wall hanging of a life sized fireplace. 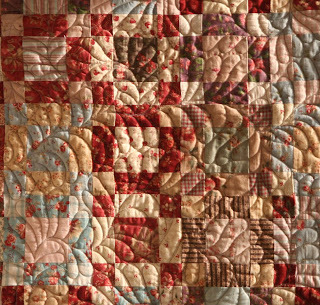 Today I got my copy of Popular Patchwork, who are printing it as a three part project, and I love the photograph they have taken of it. I will have to ask someone to pat the model for me. It could be used just as a decorative piece, or by adding Velcro to the back of all the decorative items it works as an advent calendar too. The stockings button on and would be great to hold a few small presents. 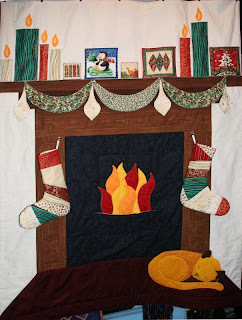 The fireplace and it's quilting is very closely based on the fireplace in my sewing room. 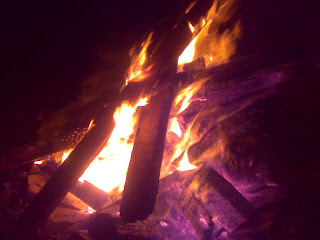 The cat would have to be Heimdal who is my ginger tom and love the fire. I also have designs for decorations to hang on your real fireplace (if you are lucky enough to have one) which I will be teaching at Patchwork Corner on the 20th October. We will also look at making Christmas stockings and quilted cards. I've think I rather like having regular classes. I found myself looking forward to going to work today, last night, and the class lived up to my expectations. 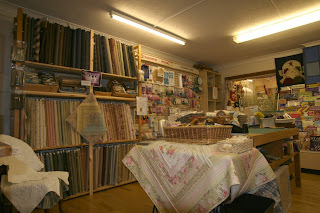 In fact they have inspired me, along with Jenny who runs Patchwork Corner. 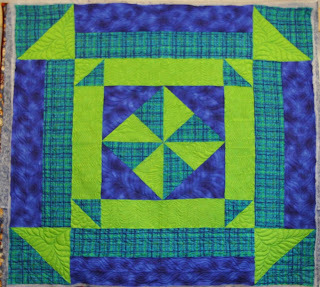 One of my students started a sampler quilt today, and started with tumbling blocks, which had me thinking about hexagons. 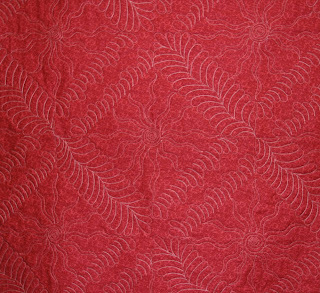 Jenny suggested I should make a quilt with the fabric range I really liked and talked her into, and another student was telling me I would think of a clever way of joining quilt as you go sections. 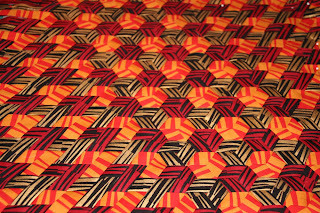 So I am thinking about these fabrics, sashing and hexagons, which lead me to my birthday quilt. 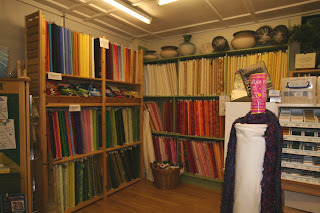 For my birthday I was bought the fabrics to make me a new quilt for the bed. 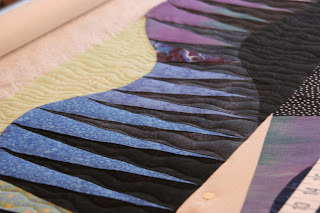 It is the Graceful Geishas range from Loni Rossi, and I wanted a plan to use the multi fabric panels she has done. I bought eight panels, the largest part of each will become a block in it's own right. 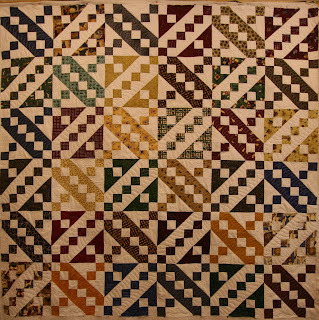 I will set nine blocks to make the main body of the quilt, so I have to create a center block. 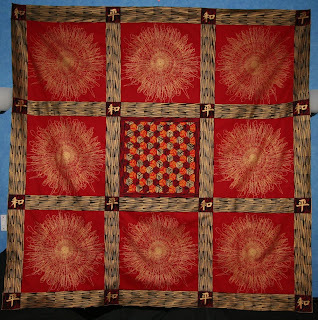 When we were in Sweden I saw some woven panels with come from a Japanese book and make hexagons (among other things). So above you can see the start I have made on the center piece. It will end up about 15" square and each bias strip is 18mm. 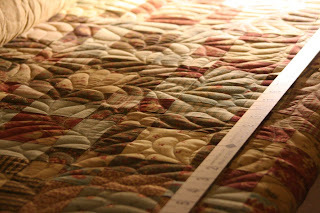 Yes I know I shouldn't mix units, but the bias maker and it's strip cutter are metric and I make quilts in imperial. 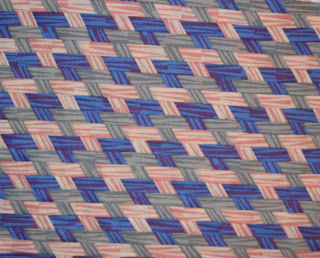 It will all work in the end, as the width of the strips really doesn't matter. Of course there will be sashing between the blocks and I will be able to use the little medallions off the panel in the intersections. I think it is going to be a fun project. It also means I have something new to show my class tomorrow night. So thanks guys, it wouldn't have happened without you. 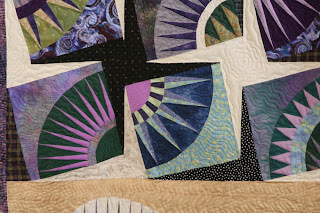 Oh and I think I have a solution for machine sewing quilt as you go without the zigzag.